Table runner or banner, brown velvet ground with embroidered scenes, hemmed and fringed with white cord. Reads, ' Souvenir of Egypt'. In centre is a laurel wreath with a crown and 'NZ Onward' inside. On left is a scene with two palm trees and three pyramids with Arabic script in the sky; on right is a N.Z. Flag and an Egyptian flag crossed with 'Egypt 1941'. Along the very bottom reads, 'To Mum with best wishes for the 11th from Owen'. 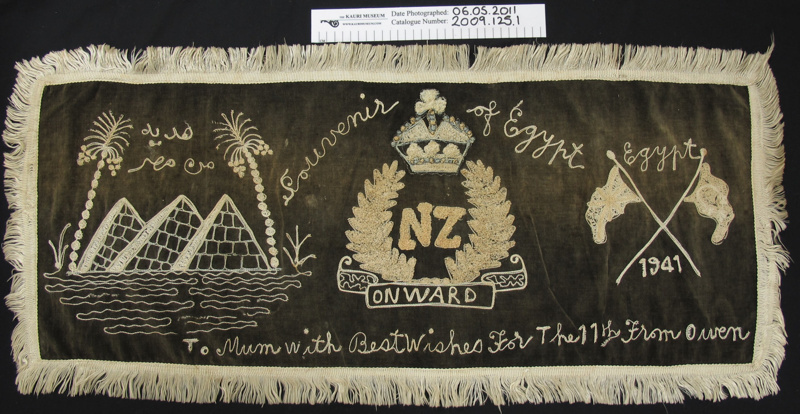 This cloth was sent by Owen Dodds to his mother Ada whilst he was a POW in Crete.